DireWolf Dog Stanley shedding as winter turns to spring. Many people ask us if the American Alsatian dog sheds. Yes, they certainly do. Just as wolves in the wild exchange their winter coats for summer ones, American Alsatian DireWolf Dogs lose all of that fuffy cotton down that keeps them warm all winter. There are dog breeds that do not shed or shed minimally. 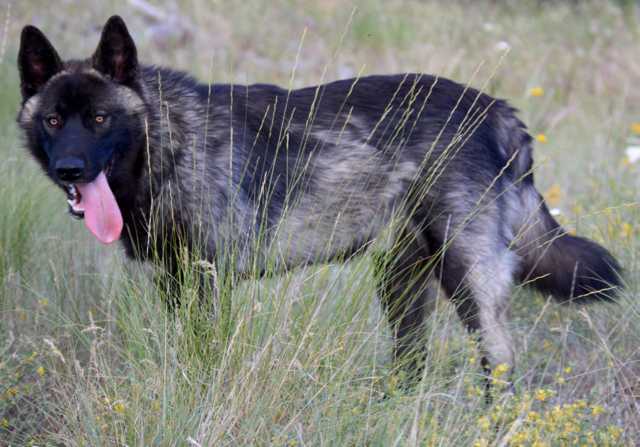 Low shedding dogs possess one or two copies of a gene (MC5R genotype) that retains their coat much of the year and even into years beyond. These types of dogs may shed some of the individual hair creating occasional dust bunnies in the house, but they do not, generally, shed out chunks of hair with the changing seasons. Furthermore, dogs with furnishings or wire-haired coats tend to also be low shedders. Your family may assume that a non or low-shedding dog is the ideal for your life, but here are several reasons you should consider the superior benefits of a dog that regularly sheds its coat. A significant benefit of a dog that seasonally sheds is the ability for its coat to remain odor free. When a dog retains its coat year after year, that dog tends to smell due to the retained debris and dirt that mixes with oils in the dog's skin producing a pungent, accumulating odor. In contrast, a dog that regularly sheds naturally eliminates odor and debris that gets caught in the coat as it ages allowing its coat to always stay fresh and new. Another great benefit of a dog that seasonally sheds is the ability for its coat to stay naturally clean which means less work, time, and money with grooming. When a dog retains its coat, the oils that accommulate on the skin, due to a light perspiration from the hair follicles, retain more dirt and grime. Although oil production is an important part of healthy skin and hair, with a dog that does not shed that means more trips to the groomers (thus more money) as well as more brushing to stimulate hair exfoliation and elimination of debris. On the other hand, a dog that naturally sheds its undercoat when the weather changes only needs a serious brush out or blow out with a blow dryer twice a year. Much of the rest of the year is simply maintenance brushing as one would do with any coat type. All wild animals have a double coat. A double coat is highly adapable to the environment; less undercoat in the warmer parts of the world and more undercoat in the colder parts of the world. Man is the creator of dog breeds without undercoats that do not shed. Dogs that lack a fluffy undercoat are more suseptible to cold weather and must be kept inside during colder temperatures because it is the undercoat that shifts and changes in thickness depending on the weather. A dog with a double coat, however, is nature's way of giving your dog the natural ability to stay cooler in the summer as the breezes can penetrate to the skin and to stay warmer in the winter when the thick undercoat keeps out the snow and rain. Dogs with a thick double coat can withstand temperatures of seventy-five degrees below zero fahrenheit and with shade and water availability, dogs that shed their double coat completely can withstand temperatures of 120 degrees fahrenheit. What an adaptable species the incredible canid is! American Alsatian DireWolf Dogs usually shed profusely twice a year with the changing seasons; once in the spring and again in the fall. At this time the fluffy undercoat comes out in clumps. It is important to brush all of this fur out during this time so that your dog will benefit from the natural shedding process. As noted, this will keep your dog clean without bathing, keep your dog from retaining odors, and is a natural way for your dog to cool or heat itself for the coming weather. Nature is an amazing device that helps animals adapt to their environment. It is our opinion that we, humans, should always seek to go with nature, instead of fight against it, as much as possible.